In 1866 the Snider-Enfield was produced as a conversion of Enfield Pattern 1853 with a hinged breechblock and barrel designed for a .577 cartridge. Later Sniders were newly manufactured on the same design. 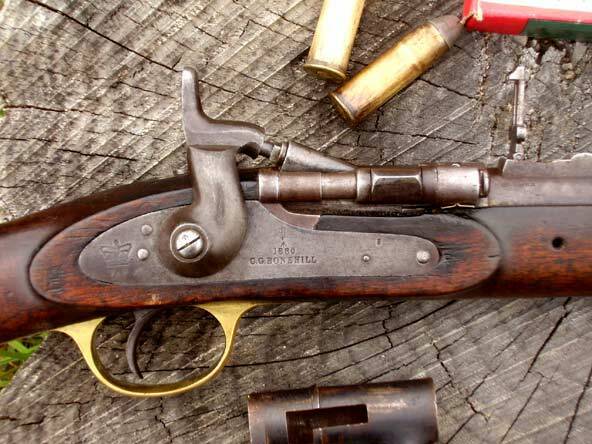 The action was invented by an American, Jacob Snider, and adopted by Britain as a conversion system for the 1853 Enfield. The conversions proved both more accurate than original muzzle-loading Enfields and much faster firing as well. Converted rifles retained the original iron barrel, furniture, locks and cap-style hammers. The rifles were converted in large numbers, or assembled new with surplus pattern 53 iron barrels and hardware. The Mark III rifles were made from all new parts with steel barrels, flat nosed hammers and are the version equipped with a latch locking breech block. The Snider was the subject of substantial imitation, approved and otherwise, including: Nepalese Sniders, the Dutch Sniders, Danish Naval Sniders, and the "unauthorized" adaptations resulting in the French Tabatiere and Russian Krnka rifles. The Snider-Enfield Infantry rifle was particularly long at over 54 inches (1,400 mm). The breech block housed a diagonally downward sloping firing pin which was struck with a front-action side mounted hammer. 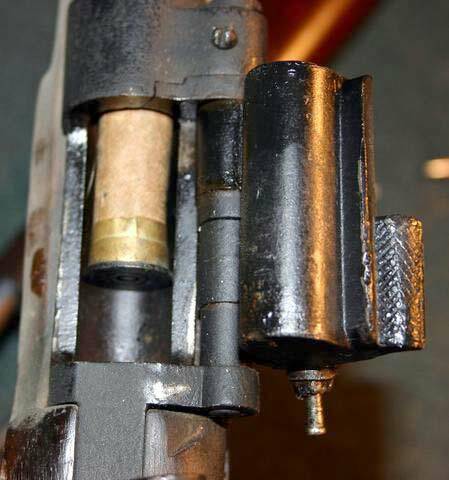 The firer cocked the hammer, flipped the block out of the receiver with a breech block lever, and then pulled the block back to extract the spent case. There was no ejector, the case had to be pulled out, or more usually, the rifle rolled onto its back to allow the case to fall out. The Snider saw service throughout the British Empire, until it was gradually phased out of front line service in favor of the Martini-Henry, in the mid-1870s. The design continued in use with colonial troops into the twentieth century. The British .577 Snider-Enfield is a type of breech loading rifle. It was one of the most widely used of the Snider varieties, (the action invented by the American Jacob Snider). It was adopted by Britain as a conversion system for its ubiquitous Enfield 1853 rifled musket muzzle loading arms. In trials, the Snider Pattern 1853 conversions proved both more accurate than original Pattern 1853s and much faster firing as well. From 1866 on the rifles were converted in large numbers at the Royal Small Arms Factory (RSAF) Enfield beginning with the initial pattern, the Mark I. New rifles started as Pattern 1853s, but received a new breechblock/receiver assembly. Converted rifles retained the original iron barrel, furniture, locks and hammer. The Mark III rifles were newly made, with steel barrels which were so marked, flat nosed hammers, feature a latch-locking breech block. The Snider was the subject of substantial imitation, approved and questionable, including the near exact copy of the Nepalese Snider, the Dutch Snider, Danish Naval Snider, and the "unauthorised" adaptations of the French Tabatiere and Russian Krnka. It served throughout the British Empire, including the Cape Colony, India, Australia, New Zealand and Canada, until its gradual phase out by the Martini-Henry, beginning in 1874 but still being used by volunteer and militia forces until the late 1880s. The Snider-Enfield Infantry rifle is 54 1/4 inches, longer than most rifles of the time. It used a new type of metal cased cartridge called a Boxer cartridge after its designer. The breech block houses a diagonally downward sloping firing pin struck with a front-action lock mounted hammer. The action operates by the shooter cocking the hammer, flipping the block out of the receiver to the right by grasping the left mounted breech block lever, and then pulling the block back to extract the spent case. There is no ejector, the case being lifted out or, more usually, the rifle being rolled onto its back to allow the case to drop out. The rifles are usually marked Mk I, Mk II or Mk III, the Mark IIIs being those with steel barrels and locking latches on the breech blocks in place of the simple integral block lifting tang. The Snider-Enfield was also produced as a Carbine, being a shorter version of the full-length infantry rifle. Carbine rifles were issued to Cavalry and Artillery units. There are also "Trade Pattern" Snider-Enfields, being Snider-Enfields made for private purchase by various English gun-makers. These were often intended for sale to members of volunteer military units, or simply to anyone who might wish to purchase a rifle.